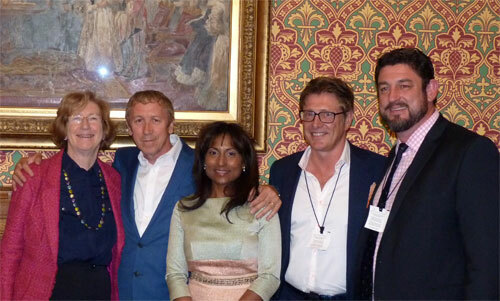 Baroness Meacher hosted a reception at the House of Lords to support our Foundation Partners, Talking2Minds, in their work to help people overcome Post Traumatic Stress (PTS - often referred to as PTSD). 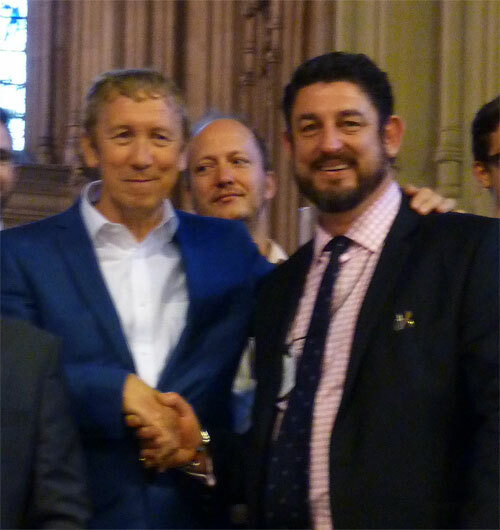 Paul Hardcastle has just re-mixed and re-launched his famous song, '19', to focus on the plight of veterans with Post Traumatic Stress. He commented, "Talking2Minds' therapy helps veterans get over their PTS and get their lives back. The benefits to them, their families and society are huge and it is my pleasure to support their vital work. More needs to be done to help our soldiers returning from service, not to learn to live with the problem, but to get rid of it and get their lives back." Baroness Meacher said that she has a personal acquaintance who has suffered with PTS and it is critical therapies like that of T2M which appear to be so effective are brought into the mainstream so that more people can benefit. "Post Traumatic Stress is not a 'Disorder' - I fully support Talking2Minds' view that it is a perfectly understandable reaction to very exceptional circumstances. We should get rid of the 'D' in PTSD and more work needs to be done so that T2M's therapy can be evaluated properly by the authorities so that it can be recognised and used to the benefit of all those affected by PTS." Dr Roger Prentis of the Foundation highlighted the social and economic logic of recognising T2M's therapy and using it to help people overcome their PTS, rather than just helping them to accept and live with it. "The economic argument is clear. All T2M's work is done by volunteers, giving their time and money to this vital cause. The work should be funded properly so that more can be done and the benefits realised by as many veterans and others as possible. Helping someone overcome PTS, regain their self-esteem and take control of their life benefits them, their family, their community and society. They stop being a 'drain' on society and start to contribute positively. The government is keen to get people off benefits - T2M's therapy not only does that, it brings people back into contributing positively to society and supports the ethos of the Armed Forces Covenant."" Paul and his business partner, Neil Utley, presented a cheque for £10,000 to Rob Paxman, CEO of T2M as their first donation. Rob thanked the Utley Foundation for their generosity and commented, "This money will go a long way to support our vital work helping veterans to overcome their Post Traumatic Stress. We have worked successfully with over 750 people to-date and are always careful to evaluate the success of our therapy. Often, people who have tried alternatives on offer from the NHS and other charities come to us because the other methods haven't worked. We think that our Paradigm Therapy is the only one to successfully help people overcome their PTS and re-gain their lives. It is impossible to put a value on the positive changes we see in those doing our 'Change Courses' as we call the therapy process. The benefits to them, their families and their communities are so dramatic. It is a no-brainer that more people should be allowed to benefit from our therapy and this generous donation will help us to help many more people."